I’ve decided a baby in your belly affects your brain more than anything else, except perhaps your bladder. Aside from being absent-minded, sobbing at the drop of a hat, and being so clumsy I’m practically afraid of my own self, I find it difficult to think about anything but what needs to be done next to prepare for the baby’s arrival. I’m trying not to dwell on fact that my due date is only a little over three weeks away. Yikes! Julie sent me four colors of lurex. Yum! Lurex. 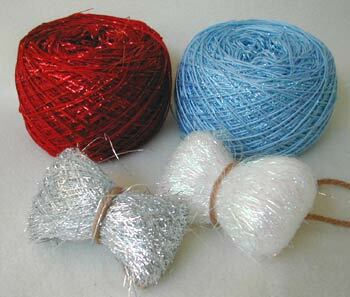 She wound the red and light blue lurex with matching thread. What a sweetie! Thank you, Julie! I had mailed Jackie a box of various yarn samples because she lives in the Philippines and, for the most part, they have only thread there. In return, she sent this fantastic package to me. I love it all, Jackie, thank you! 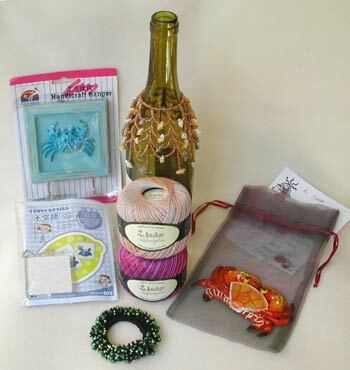 Clockwise from top left: crab hanger, bottle topper (she didn’t send the bottle; I just used it for display), crab magnet, two balls of yummy variegated thread, beaded hair tie, and crab keychain cross stitch kit. 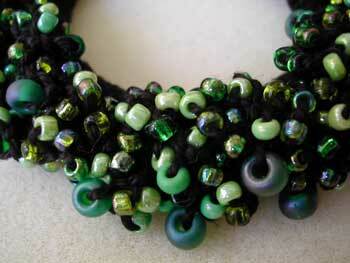 Detail of the hair tie. Gorgeous! 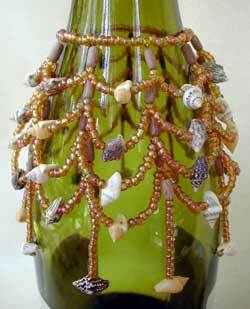 Closeup of the beaded bottle topper. Beautiful work! Ashleigh sent me a very cool tomato-y package. Fun stuff! Thank you for being so thoughtful, Ashleigh! 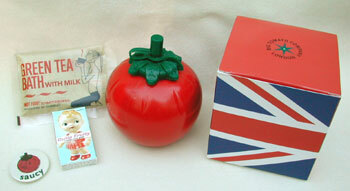 In no particular order: a very neat-o plastic tomato container and saucy tomato pin in a Brittania gift box (all from the big tomato company), green tea bath powder, and cutie fruity gum. 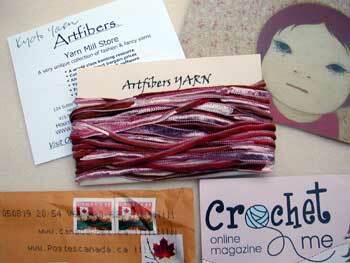 Kim sent me this yummy Artfibers Yarn Tasting(tm) of Kyoto yarn from her trip to Okaland, CA for the CGOA Chain Link Conference. Thank you, Kim, you rock! L’Tanya of Black Purl Magazine sent me this yarn (well, she actually let me choose it myself) as a thank you for coming up with the name for her new web site, World Stitch. She wanted a name for a non-profit network of needlecrafters, with its focus being ethnic, international, and historical. World Stitch came to me almost a soon as I started to think about it, and luckily the dot org domain name was still available! 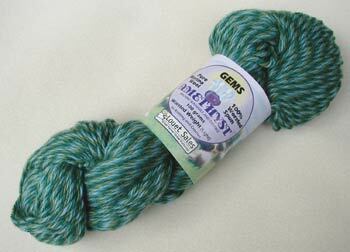 Louet Gems Amethyst merino wool in Clover colorway. Detail of Gems Amethyst in Clover colorway. 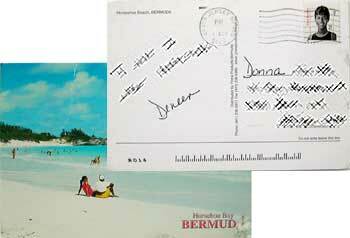 Deneen sent me this postcard from her trip to Bermuda. Thank you, Deneen! Baby gifts? You’re probably wondering about those. I’ve recieved a few, but that’ll be another post! Nice loot!!!! 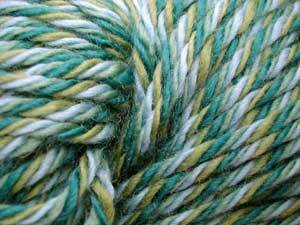 It was soooooo goood to see a blog post from you, Donna…I’ve missed seeing Yarn Tomato bolded with one or two new posts in my Bloglines. LOL I totally forgot I sent you that Lurex! You have baby brain!! That happens! Remain calm. You still have 18 years at the least till you get your own mind back!! Good luck. congrats and good luck with your next few weeks. I’m only halfway there, but I understand … baby on the brain! We have our u/s on Friday … so that’s this weeks focus. :) Best wishes & wonderful gifts! Love all the giftiees. What nice thoughtful things you got! you got some yummy stuff, girl!! yep, that’s baby brain – soo completely absent-minded.